Sporotrichosis is a chronic infection of the fungus Sporothrix schenckii (S. schenckii) that usually affects the skin (although it has other, rare forms that affect the lungs, joints and bones). This fungus is found worldwide and is naturally present in soil, hay, rose thorn, sphagnum moss, decaying vegetation, and other plant materials, and infects the skin through small cuts and punctures. Because of this, this disease usually affects people who work with soil and plants, such as farmers, horticulturists, and gardeners. Because of this occupational exposure, sporotrichosis is more prevalent in adult males. Sporothrix schenckii (S. schenckii) fungus. 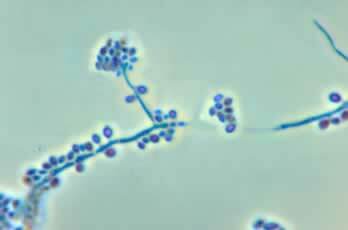 In the rarer, pulmonary form of sporotrichosis, the infection took place when S. schenckii is inhaled. A rare form of transmission of this fungus is through cats and armadillos. Sporotrichosis is not communicable from person to person. Red, nodular lesions of the skin, along with secondary lesions of the lymphatic vessels. This is a rare form of sporotrichosis that causes nodules in the lungs. A rare form of sporotrichosis that causes arthritis, osteomyelitis or inflammation of the bone (osteoarticular sporotrichosis), and also infects the central nervous system and brain (called sporotrichosis meningitis). This usually occurs only in people with weakened immune system. In disseminated sporotrichosis, the infection spread from the primary location (skin or lung) to other areas of the body. This form of sporotrichosis infection is a dangerous and even life-threatening medical condition. The S. schenckii infection progresses slowly, with incubation time anywhere between 1 week and 3 months – the first symptom is usually a small bump in the skin the looks like an insect bite. This bump is usually found in the finger, hand, or arm where the fungus enters through the skin. The bump can range in color from pink or red to purple. Although it is usually painless, it can be slightly tender. The lesion will then grow larger, discolor, and may even develop into an ulcer or open up to look like boil and drain clear fluid. Left untreated, this ulcer can become chronic and persist for years. Additional bumps may develop and may form along lymph nodes and vessels. 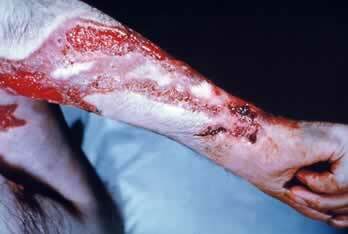 Left untreated, secondary bacterial infections such as cellulitis can develop. Pleural effusion or pooling of blood or lymph fluids into the pleural cavity. (A pleura is the thin membrane that envelops the lungs and fold back as a lining for the chest cavity). In many patients, sarcoidosis (lesions in the liver, lungs, skin, and lymph nodes) and tuberculosis can also develop. This form of the disease can lead to or be accompanied by arthritis and osteomyelitis or infection of the bones. Due to its subtle and slow-growing nature, diagnosis of S. schenckii infection can be difficult. A confirming diagnosis is done through culturing S. schenckii fungus in the pus, sputum (saliva, phlegm, mucus or spit), synovial tissue biopsy, and arthrocentesis or bone drainage. Antibody against S. schenckii can also be used – however, due to variability in sensitivity and specificity, it cannot be used as the sole basis for diagnosis. Higher antibody titer in the cerebrospinal fluid as compared to blood or serum antibody against S. schenckii suggests the presence of sporotrichosis meningitis. In case of pulmonary sporotrichosis, due to similarities in symptoms, other diseases such as tuberculosis and sarcoidosis must be ruled out. Similarly, in cases of disseminated sporotrichosis, osteomyelitis due to bacterial infection and bone cancer must be ruled out. Skin lesions are treated with saturated potassium iodide solution, usually given for 3 to 6 months and usually continued for 1 to 2 months after lesions have completely healed. An antifungal medication, itraconazole inhibits fungal cell growth. In cases where the patients cannot tolerate this medicine, flucanozole can be used. In some cases, lesions must be excised and drained. Patients may need to take this antifungal medication for several months, even up to one year. This is an intravenous drug with serious potential side effects, including fever, chills, nausea, and vomiting. Surgery may be required to remove the infected bone.